It’s finally summer here in the Washington, DC region. Now is the time to schedule “innovation vacations” to unplug, reflect, and savor the great outdoors. You will find some cool videos below that we just released. 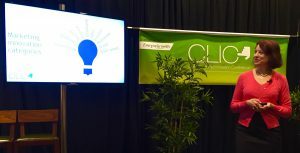 Check out the three complimentary marketing innovation videos below from our annual CMOs Leading Innovation Conference. In addition, if you are a VP level marketer, CMO, or CEO, you qualify for a time-limited discount to our 2nd annual CMOs Leading Innovation Conference (CLIC ’16). CLIC ’16 happens over 1 ½ days starting October 20-21. We are hosting the conference at the historic Airlie Retreat Center in Warrenton, Virginia. Early response has been excellent! As of this week, only 6 overnight rooms remain. You will be joined by senior marketing leaders from Southwest Airlines, Hilton, Gannett/USATODAY, Infor, The World Bank Group, NACD, and WeddingWire (to name a few). We just confirmed Heather Figallo, Head of Marketing Innovation and Customer Experience at Southwest Airlines. She will be sharing marketing innovations that reduce customer friction and win loyal fans at this fun, familial, customer-obsessed organization. For more information about CLIC ‘16, visit this page. Then click on the big orange “Details and Registration” box. Use discount code Friend10 and select the non-member rate. You will save at least $250 if you register before June 15, when the code expires and rates increase. Only six rooms remain—so don’t delay.